Published: March 11, 2013 at 12:53 p.m. Updated: March 12, 2013 at 05:44 a.m.
After insisting that Percy Harvin is not for sale, the Minnesota Vikings have shifted course. Fox Sports insider and NFL Network contributor Jay Glazer reported on Monday that the Vikings have agreed to a trade that will send Harvin to the Seattle Seahawks for a trio of draft picks. Once Harvin passes a physical, the Vikings will receive the Seahawks' first-round (No. 25 overall) and seventh-round selections in 2013, along with a mid-round pick in 2014. » Was Harvin a bigger trade than Boldin? » What's Percy Harvin's impact? 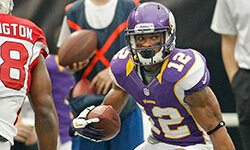 » How will the Vikings replace Harvin? It's a stunning move that will strengthen an already powerful Seahawks roster with a premier wide receiver and return threat, while simultaneously ending Harvin's often rocky four-year tenure in Minnesota. It's a bitter pill to swallow for Vikings fans. Harvin was the Vikings' most exciting player, with the ability to scorch defenses as a pass-catcher and pick up devastating chunks of yardage in open space. Adding Harvin to Russell Wilson's arsenal in Seattle puts the NFC West -- and the entire conference -- on blast. Harvin goes from playing alongside Christian Ponder to becoming a trigger in the read-option attack Seattle rode to the playoffs one season ago. NFL.com's Ian Rapoport reported the Vikings spoke with multiple teams about dealing Harvin, according to a source with knowledge of the process. If the deal goes through, the Seahawks will be tasked with locking Harvin up to a long-term deal, according to Rapoport. That might get sticky. Harvin was asking for no less than $10 million per year in an extension with the Vikings. The 24-year-old receiver is set to make $2.8 million this season in the final year of the rookie deal he signed in 2009. It was reported over the weekend that Harvin demanded a trade for the second time in less than a year. Vikings general manager Rick Spielman has said all offseason that wouldn't become a reality, but here we are.